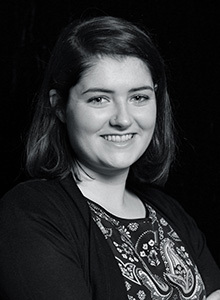 Fiona is a PhD researcher at CONNECT in Tyndall National Institute. My name is Fiona Barry. I am doing a PhD with the ‘Electrochemical Materials and Energy Group’ here in Tyndall National Institute. I am working on developing a water sensor for pollutants in collaboration with Analog Devices. I did my final year project here in Tyndall with the Life Science Interface Group. I was making a sensor to detect dissolved oxygen, which was really interesting, and I really enjoyed it. I wasn’t fully convinced that research was for me though so I did a taught Master’s with a placement for six months in a research centre. I loved it and I decided to pursue a PhD after that. I contacted people here in Tyndall who were doing some interesting work, and started working with Dr James Rohan as my supervisor. What do you like about being a researcher? I like lab work: it is constantly changing. We are developing ideas and learning new things. It’s weird, but I like studying and learning new things. I really enjoy that part of it. It’s great when all your research comes together and there is a story to tell. I love this, and sharing it with everyone. Was it your love of this lifestyle that led you to choosing these subjects? Initially, I thought of doing pharmacy, but I took Biological and Chemical Sciences at UCC. In that course, I thought of focusing on biology, but after doing chemistry I just had more interest in that. Then I went into chemistry forensic science and that was very interesting and I just went from there. I never had a dream about doing a PhD all throughout college; it was just in fourth year that it became a possibility. Was it the subject that interested you or was it the challenge of a PhD? It was more the challenge and then, from doing a Master’s, I became very interested in sensors. But, in between doing my PhD and my Master’s I did magnetics plating and silicon plating. It was really enjoyable and I was offered a PhD in it, but I just couldn’t see myself sticking with it long term. I just thought sensors were more interesting. Is there anything that has surprised you about the PhD? Not yet; I am 6 only months in so haven’t had time for that. The fact that I work with an industry partner provides organisation and focus. We have a lot of deadlines and that is helpful. There can be delays in research, things take time, there are always problems, but so far it has been on track. I am very happy with that. With research, you will come across challenges, and it can be hard to stay motivated. It’s important to be doing something you love. Is there anything that you experienced that changed how you view the world? I did my Master’s in Eindhoven in The Netherlands. I spent six months living by myself and I survived – I learnt that I am tougher than I thought! Was that a fun experience? Yes, but I was happy to come home as I was ready for doing a PhD here in Tyndall.